The Hot Tub is Calling You! Our Pine View Yurt now has a private hot tub on the back deck to relax in. We chose the Dr. Wellness G-2 Tranquility Spa. It has 2 loungers with lots of jets for your back and legs. It is the perfect ending after a day of hiking, biking or just walking the hills in downtown Eureka Springs. We have worked to get the electrical, plumbing and ceiling tongue and groove installed. Framing of the huge back deck. Winter has arrived. And with it comes the inevitable construction delays. After the wall were erected on Yurt 1, it was time to raise the Roof. First step was to calculate the height and positioning of the center compression ring. Once the calculations were complete, checked and rechecked, it was time to construct the stand on which the compression ring would sit. After it was build, Gator and I had to figure out how to get the stand on top of the scaffolding. After a couple failed plans and near drops or falls, we finally succeeded. Next we had to get the compression ring on top of the 14′ 7″ stand. HUM? For this we had to bring in some additional muscle. Much like the stand, several attempts were made using a pulley system to no avail. So, we decided on trying to build a ramp from the top of the wall to the stand. After a couple hours, the Eagle had landed. The next task was to secure the roof rafters from the top of the walls to the compression ring. Some slight modifications had to be made to the rafters before we could install. After several hours of tweaking we finally had the first four rafters up. Then came the rain. We tarped the yurt with a 6 mil 50 x 50 tarp. No easy feat on a rocky slope, I will let you know. We though we had the tarp tight enough to slope the water off the roof, but upon inspection the next day we had huge areas on top of the roof holding massive amounts of water. The tarp grommets had pulled free on several of the tie-downs. So, it looked like we had built an awesome rain water collection system. After several hours I got the water siphoned off the tarp and we reinforced the tie-downs. Then came the snow. The dogs loved it, the production schedule hated it. I was pressing to try and get the rafters up before the weather set in so we would work inside on the ceiling panels, but it did not happen. That is the update. 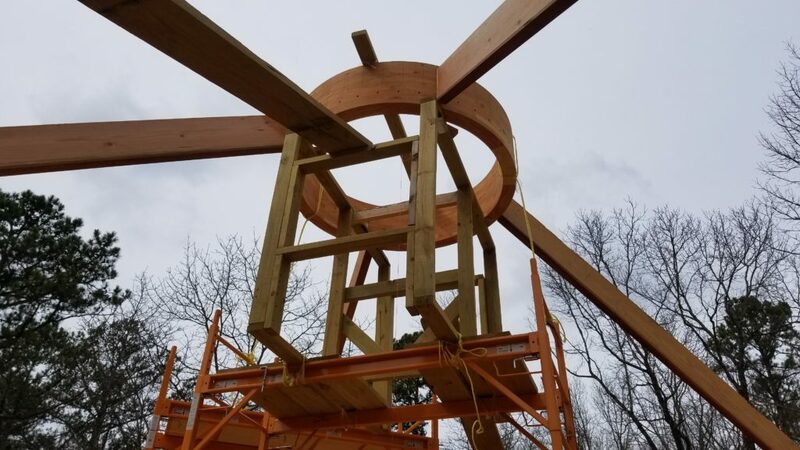 Next up is getting the rafters up on Yurt 2, building and installing 80 ceiling sections, wiring the interior, plumbing stubbed out, AC lines installed, and finally having the outer ceiling, interior walls and exterior floor spary foamed with insulation, and metal roofing installed. Wall Panels, Window Panels, Door Panels, Oh My! During the inclement days the 20 wall panels are being fabricated. The sides of each panel is cut at a 9 degree angle to account for the curvature of the yurt. We are doing 4 picture windows (3.5 feet by 6 feet tall) and a double hung window in the bedroom, bathroom and the kitchen. So we have 7 window panels, 1 door panel and 12 solid panels. Prepping wall panel with outer cedar cut with tongue and V grove underneath. JT adding the western cedar outer sheathing. Notice the bottom cedar sheathing has 2 finish screws on each side. This is so that after the panels are set, the piece can be removed so flashing can be installed so water will not wick up the panels.